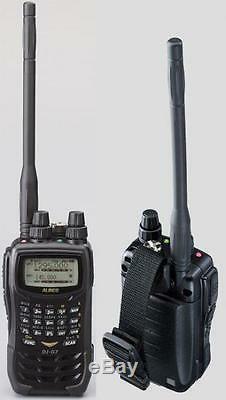 ALINCO DJ-G7T 2M/70CM/23CM Tri-band Handheld Radio - Authorized Dealer. Poplular Accessories for the Alinco DJ-G7T. ALINCO EDC-36 Car charger for DJ-G7T. Diamond SRH999 6m/2m/70cm/23cm HT Antenna. Get ready for action as you hear signals that you may never have heard before. Enjoy a variety of scan modes and options that include Time -set scan, 50 pair of programmable scan memories, Timing adjustable priority scanning and Alinco's patented Channel-Scope? Visualize the presence of radio signals on the display. There are also two modes of bug detector functions. Restrictions may apply to frequency combinations for Full-duplex QSO. Customize the DJ-G7 to your personal preferences. Set the parameters to suit your needs and likes. Choose the display language (English/Japanese) lamp function and display contrast and brightness. Select Auto-Power Off / Battery save function. Turn sounds (beep, bell, end beep) on or off. Set the transmitter for VOX / TOT / BCLO. Control the DTMF burst timing, link your scan banks, set priority scan-timing and memory skip functions and more. Personalize the DJ-G7 to make it, "YOUR DJ-G7". Simultaneous full duplex operation of any two bands 144MHz, 430MHz, 1200MHz. Large LCD full dot matrix screen with easy to see and understand display. Rugged polycarbonate body resists dirt and dust. High-grade water-resistant materials compatible to IPX7. Die-cast chassis for rugability and to keep the RF-PA cool. Twin "user assignable" controls with easy to use knobs for adjusting AF output and Squelch levels. 39 CTCSS and 104 DCS encode/decode. Tone scan to detect unknown tones. DTMF Auto-dialer for autopatch access. Up to 16 characters per group in 9 groups. SMA antenna port for external antenna use. Auto Power-Off, Bell, End-beep, Battery Save function, BCLO and more. Newly designed EBC-23 Swing belt clip. High-Capacity EBP-73 Li-ion 1200mAh battery and Drop-In charger are standard. Keypad selectable wide / narrow bandwidth and mic gain External DC power port supports 13.8V DC for mobile operation. Cloning capability between DJ-G7T units or through PC (optional cable needed). Auto-repeater and conventional repeater operation For USA repeater systems. Direct frequency input through illuminated keypad. 1000 Memory Channels with programmable memory banks. A free utility software available from alinco. ERW-4C or 7 and EDS-10 or 14 required for a PC connection. EBP-73 Li-Ion Battery Pack 1200mAh 7.4V. GigaParts ships from multiple locations across the USA, so a portion of your order may come from two different warehouses. Modified radios do not qualify for direct replacement unless GigaParts performed the modification. Is a full service computer and amateur radio store. The item "ALINCO DJ-G7T 2M/70CM/23CM Tri-band Handheld Radio Authorized Dealer" is in sale since Monday, October 19, 2015. This item is in the category "Consumer Electronics\Radio Communication\Ham, Amateur Radio\Other Ham Radio Equipment". The seller is "gigaparts" and is located in United States. This item can be shipped to United States, Canada, United Kingdom, Denmark, Romania, Slovakia, Bulgaria, Czech republic, Finland, Hungary, Latvia, Lithuania, Malta, Estonia, Australia, Greece, Portugal, Cyprus, Slovenia, Japan, Sweden, South Korea, Taiwan, South africa, Thailand, Belgium, France, Hong Kong, Ireland, Netherlands, Poland, Spain, Italy, Germany, Austria, Bahamas, Israel, Mexico, New Zealand, Philippines, Singapore, Switzerland, Norway, Qatar, Croatia, Colombia, Antigua and barbuda, Aruba, Grenada, Saint lucia, Barbados, Bermuda, Bolivia, Ecuador, Egypt, French guiana, Gibraltar, Iceland, Cambodia, Sri lanka, Luxembourg, Oman, Peru, Paraguay, Reunion, Viet nam, Uruguay.